I think I need to do a Kickstarter for this guitar. Discussion in 'Guitars in General' started by peskypesky, Apr 30, 2016. 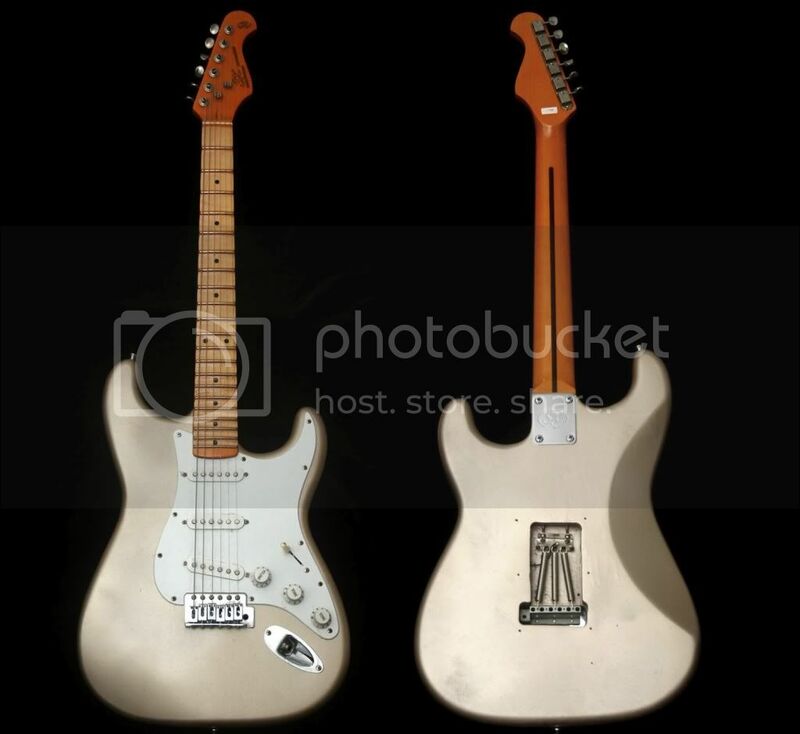 This Strat is gorgeous!!!! My favorite color yet seen. KeLynne, Turi, monty and 4 others like this. I'll give you, the color is cool, but make it look new and then i'd be interested. slider, StratoCraig, Elantric and 3 others like this. Seriously that thing looks killer. Love it. thecasterkid and peskypesky like this. OK, I have always wondered- your location says Manhattan. How do you paint a guitar there? Out a window, on the subway, in an alley... A dude spray painting a guitar body is like, one of the least offensive things a New Yorker could do in public. enharmonic, peskypesky, Cal Webway and 2 others like this. That's the nicest looking metallic finish I've ever seen. Turi and peskypesky like this. Color reminds me of the agave blue mexican strats that they made a bunch of in the 90's. Meh. The color is great. The "wear" is not great. slider, StratoCraig, peskypesky and 1 other person like this. You would need that even if you bought the guitar, it needs a total re-finish. Who knows what else is wrong with it; looks pretty abused. Cool color. Dumb fake wear. Ruins the look, especially with the "oops!-we-somehow-carelessly-and-absentmindedly-sprayed-black-first" undercoat. 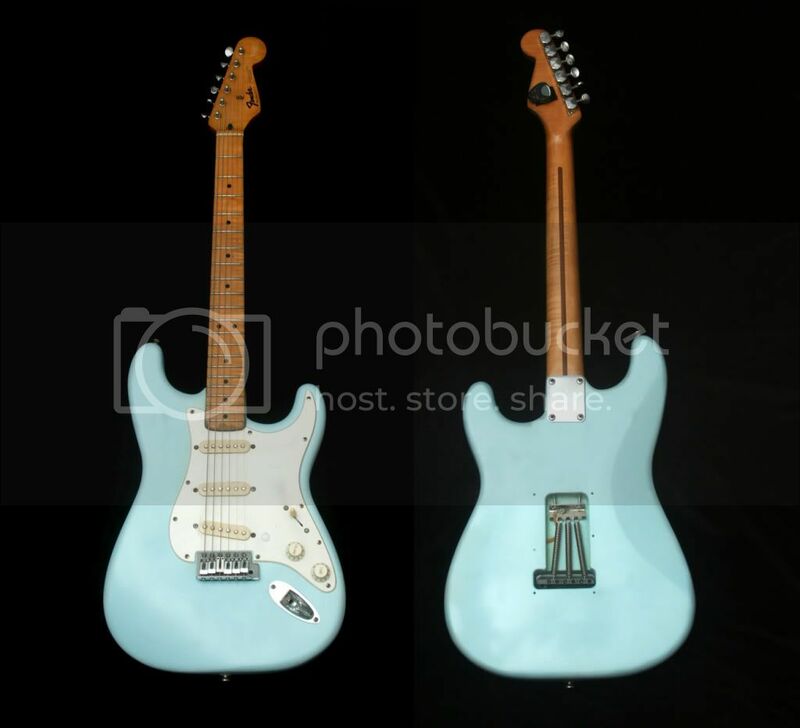 Put a new pristine glossy showroom finish of that faded teal on that strat and I'd be into it. Caribou and peskypesky like this. Painting a guitar in a Manhattan apartment is something only a desperate fool would do. So I did it twice. Basically, what I did was I completely covered my bathroom with plastic. Opened the window. Hung the body from the shower rod using a wire hanger, held my breath and sprayed. Then, closed the door and waited. Then, holding my breath, I went in and sprayed another coat. Repeated this process a few times. I had never used rattle cans before and I learned I could never paint for a living....but the bodies came out just fine for my tastes. The bathroom also survived. I have since moved to a new, somewhat larger apartment, but this one is a new renovation, so no chance in hell I'll paint in here. I'd have to do it at an artist's studio nearby. Dashface, rutxer and Pedal Dan like this. I love the agave blue Mexican Strats! But then again, blue is my favorite color, and I'm half-Mexican. Turi and dhdfoster like this. right?? I'm floored by how great it looks. Iridescent. slider, Turi and Caribou like this. Start that Kickstarter man for sure. People are sick of donating to charities anyway. People wanna support guitar addictions now.